We all can learn from our experiences. The golden nuggets in this book will help you to discover God-given truth and divine revelations as you dig deep into the mysteries, all hidden within Jesus. Each lesson is designed to inspire, motivate and encourage you. Seemingly small pebbles of truth can turn into gold as we receive them and apply them to our everyday life. In my vision, I was shown pebbles in the shallow water running out of the River of Life and I was to pick up those pebbles. As I did, they actually turned into nuggets of gold! Those nuggets of gold turned out to be Words of Knowledge and Words of Wisdom. Throughout this book you will find yourself picking up pebbles that have turned into Golden Nuggets blessing you with divine insight for situations you might be encountering. 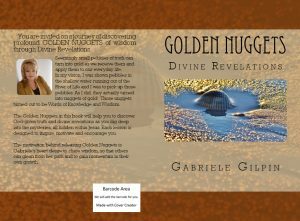 The motivation and passion behind releasing Golden Nuggets is Gabriele’s heart desire to share whatever wisdom she can to others, so that they can learn and glean from her journey and accelerate their own growth by applying them. I pray for a fresh revelation on taking up the sword (Word of God) and what this entails for you and divine insight to give you clarity and freedom from pressure, manipulation and confusion. In His manifest presence, we can hear His words of life, light, and power and follow His lead.